The Joy under the net, while setting. 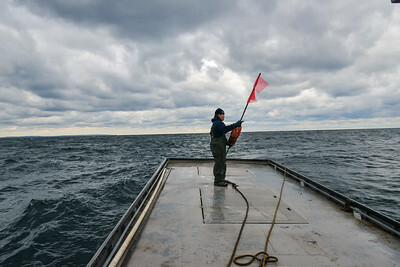 Photo taken while I was crew, from the skiff, at a quiet moment, just north of S. Manitou Island. 2012. Dipping whitefish. L to R: Joel Petersen, Chris Herman, Darryl Herman. I'm in my 16' wooden runabout; it was a glass-calm day on the water. I shut off and raised the outboard motor while floating so close to the net, to avoid getting caught in it. 2013. This is one of my all-time favorites. 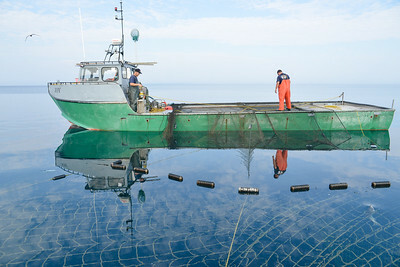 The Joy is under the trap net, which shows beneath the surface of the water while clouds reflect. It's almost an infinity day, when water and sky blend visually at the horizon. L to R: Joel Petersen, Darryl Herman. Obscured from view: Chris Herman. I followed the Joy on this occasion in my 16' wooden runabout. 2013. 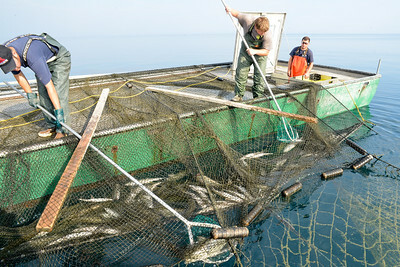 A perfect day to lift the net for whitefish. 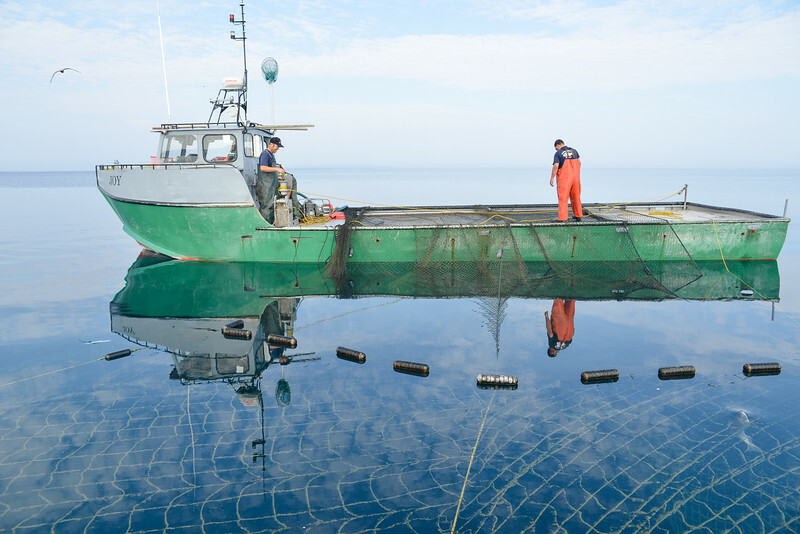 Captain and crew visit while the net slowly comes to the surface. L to R: Darryl Herman, Joel Petersen, Chris Herman. Photo taken from my 16' wooden runabout. 2013. 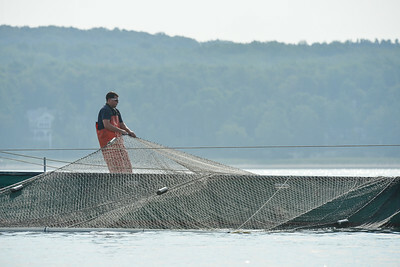 Stretching the net while the trap net boat slides underneath it. Darryl Herman. 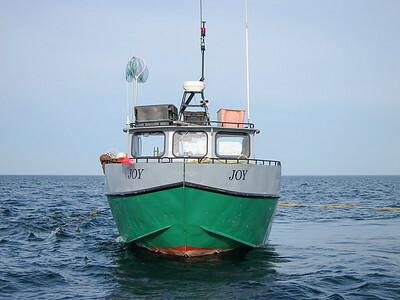 Rough day on the Joy, north of Leland. Top: Chris Herman (he didn't stay up there), Darryl Herman, and in the pilot house: Joel Petersen. 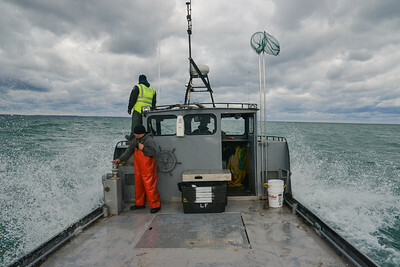 I quickly joined the guys in the pilot house; there is not much to hold onto on the open deck. 2013. 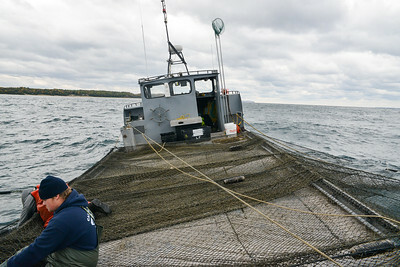 When the trap net boat begins to roll as weather and waves pick up, the crew scrambles to finish the job and get the boat out from underneath the net. Chris Herman, Darryl Herman. North of Leland. 2013. 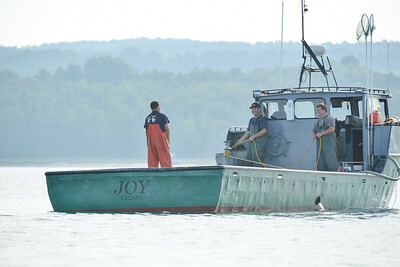 The lifting buoy is the last to be dropped into the lake as the Joy pulls out from under the net. Chris Herman. North of Leland. 2013.